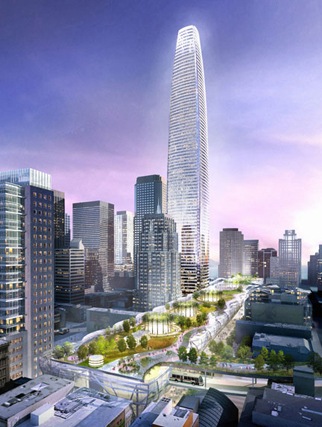 After a 10-month international Design & Development Competition, the TJPA Board unanimously selected Pelli Clarke Pelli Architects as the lead architect of the Transit Center and the Salesforce Tower. The Pelli design for the Transit Center features a 5.4-acre rooftop park on top of the Transit Center. Established in 1977, Pelli Clarke Pelli Architects is a full-service architectural practice of about 80 people. The firm has worked with corporate, government and private clients to design major public spaces, museums, airports, laboratories, performing arts centers, academic buildings, hotels, office and residential towers and mixed-use projects. To learn more about Pelli Clarke Pelli Architects, please visit www.pcparch.com. César Pelli was born in Tucumán, Argentina. In 1977 he became Dean of the School of Architecture at Yale University and established Pelli Clarke Pelli in New Haven, Connecticut. Mr. Pelli’s work has been widely published and exhibited, with eight books dedicated to his designs and theories. In 1995, the AIA awarded Cesar Pelli its Gold Medal. In 1991, the AIA selected Mr. Pelli as one of the 10 most influential living American architects. In 1989, the AIA awarded Pelli Clarke Pelli its Firm Award. César Pelli has received more than 100 awards for design excellence and is the only architect to receive a Connecticut State Arts Award. Mr. Pelli wrote the book “Observations for Young Architects” (Monacelli Press 1999) as a distillation of his thoughts on a profession he loves. One of the founding members of Pelli Clarke Pelli, Fred Clarke is Collaborating Design Principal in the studio. In 1977, he joined Mr. Pelli in establishing the firm in New Haven, Connecticut. He has served as Collaborating Lead Designer on many of the firm’s significant projects, covering a wide range of programs and locations. A career-long teacher, Fred Clarke has been on the faculty of the Architecture Schools of the University of California at Los Angeles and at Rice University in Houston, Texas. He has also served as Visiting Critic in Architecture at Yale University and continues as Guest Critic at several major universities. He has lectured internationally and has been the Keynote Speaker and Guest Lecturer at numerous conferences and exhibitions. Mr. Clarke has chaired design juries and panels for many professional organizations, including the Urban Land Institute and the American Institute of Architects. In 1992, Mr. Clarke was elected to the College of Fellows of the American Institute of Architects. In 1997, he became a First Class Registered Architect in Japan, a member of the Japan Institute of Architects and a Fellow of the Philippine Institute of Architects. He received a Fellowship from the MacDowell Colony in 1998. Rafael Pelli first joined Pelli Clarke Pelli from 1979 to 1981 and rejoined the firm in 1989. Mr. Pelli is the Principal of the firm’s New York office which was established in the summer of 2000. He is a Member of the US Green Building Council and lectures extensively on the firm’s sustainable building design efforts. He has taught at Harvard University’s Career Discovery Architecture Program, served as Guest Critic for design reviews at the Yale University School of Architecture, the University of Cincinnati, the Parsons School of Design in New York City and the Southern California Institute of Architecture. He received a Bachelor of Arts in 1978 from Yale University and a Master of Architecture in 1985 from the Harvard University Graduate School of Design.